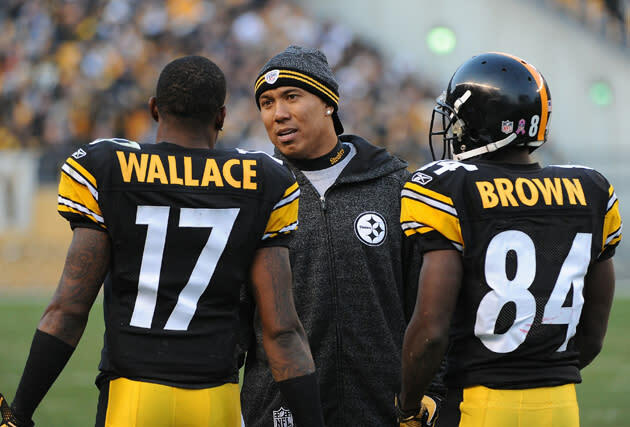 A while back, according to those in the know in Pittsburgh, the Pittsburgh Steelers gave receiver Mike Wallace a contract offer somewhere in the area of $42 million over five years. If accepted, the deal would have resolved the fact that Wallace was given a first-round restricted free-agent tender, which guarantees him just $2.72 million in the 2012 season. Wallace was evidently unimpressed, which is why he's holding out of the Steelers' training camp. The team's response to the actions of their primary receiver over the last couple of years was essentially this: Go on and hold out -- we'll give Emmanuel Sanders your role as the "X" receiver in practice, and we'll give Antonio Brown, who almost matched your numbers in 2011, your contract. And that's exactly what they did. On Friday, just two days after making their first public statements about Wallace's holdout during camp, the Steelers signed Brown to that very same five-year, $42.5 million extension. Brown will make the $540,000 he was set to make in 2012 as part of his rookie deal, but he also has $8 million guaranteed in the new deal. He'll make $4.5 million in 2013 (base salary and roster bonus), and $6 million in base salary in 2013 and 2014. "We are excited to announce that Antonio Brown will be with the team through at least the 2017 season," Steelers General Manager Kevin Colbert said in a statement. "He has played a major role in our success over the past two years and we are thrilled he will be a Steeler for many years to come." The deal keeps Brown under team control the next half-decade, and presents the Steelers with some interesting options. They can wait Wallace out and have him sign his tender whenever, have him sign his tender and trade him to another team willing to give him more money (getting a first-round pick in return), franchise him, or sign him to a long-term deal after he signs the tender. These are the hypothetical options, and according to Ed Bouchette of the Pittsburgh Post-Gazette, the third and fourth are already off the table. Having given Brown the big contract, Bouchette says, the Steelers have now decided that they will not be offering Wallace a long-term deal. So, they can enjoy his services through the 2012 season and let him walk after, or trade him to a team willing to give up a future first-rounder for perhaps the best speed receiver in the game. Bouchette also reports that there is no way the Steelers, who are already tight up against the salary cap, would give Wallace the franchise tag next year. The Steelers have a nice little cottage industry of speed receivers, having drafted Wallace, Brown and Emmanuel Sanders in the later rounds of the last few drafts. Brown proved last season that he can be one of the best No. 2 receivers in the game, but for that kind of money, he'll now be tasked with drawing primary coverage over the next few years. It's always a challenge for any receiver when he discovers that he's the primary target of any pass defense ... now matter how talented he might be. "What Mike Wallace brings to the table, which very few guys in the NFL do, is pure, pure speed," Greg Cosell of NFL Films and ESPN's NFL Matchup recently told us, when we asked him if Brown or Sanders could take Wallace's "X-iso" spot on a consistent basis. "He may be the fastest receiver in the entire league. You're concerned about that, because you miss that element. No defensive coordinator wants to give up 60-yard touchdowns -- that's just the way it works. Can Brown or Sanders be that guy? Probably not, in terms of lifting off the coverage like that. But a guy like Antonio Brown could be a very good 'X' receiver in time. He's a terrific receiver who will only get better." Brown, who was selected in the sixth round of the 2010 NFL draft out of Central Michigan, was named the team's MVP in 2011. He went to the Pro Bowl as a kick returner, and became the first player in NFL history to amass over 1,000 receiving yards and over 1,000 return yards in the same season.